... Into extreme bandwidth audio! 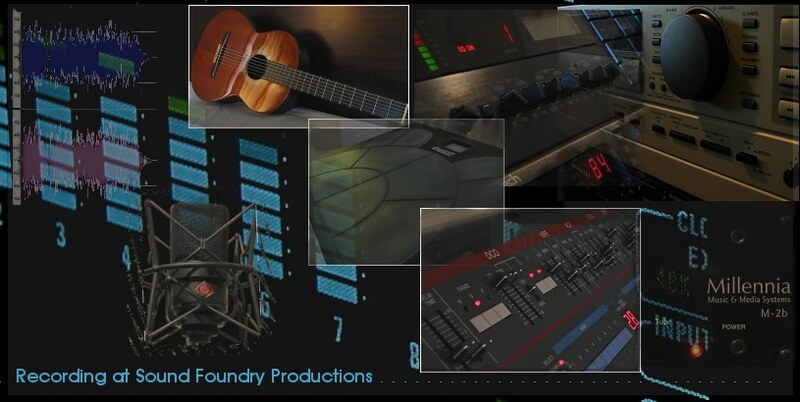 Sound Foundry Productions Video Channel! (While we all grieve with the loss of Cindy Matyi her beautiful soul and spirit lives on in this music of her last recording sessions in 2013-2014) Cindy's visual art lives on here. Video of Justin recording in the studio! Rick Sowash - Three new CD titles!! Rick Sowash - American Perennials: Three American Perennials for woodwind quintet: Folk Dance, Sea Chantey, Ragtime, Mt. Airy Wedding Suite for oboe, violin & cello, Three Piquant Pieces for oboe and string trio, Spring Fever Suite for two cellos, Picket Fence for violin, oboe & piano. Jim Connerley - Private Party : jazz duos; piano with bass, vibes, voice, sax, guitar and more! "Bowl & Bunns" New CD, Spirits Talk! a Jazzy collection of vibes, piano and band! Rick Sowash - Pastorale - with the Verdehr Trio and more! Conundrum - That Night (Christmas) A wonderful mix of traditional and modern fine arts music with: voice, flute, clarinet & piano! Plus concert recordings, video, radio and more ! In keeping with the tradition of supporting a wide diversity of music, Sound Foundry helped WMKV leap into the Airways featuring big band, vocal standards and nostalgia in 1994! Sound Foundry has provided WMKV with a live broadcast feed from Coney Island for a decade! - featuring a 16 piece swing big band broadcast live on the air over high definition phone lines. Sound Foundry has also helped WMKV broadcast live from the historical Union Terminal Train Station (now The Cincinnati Museum Center) in downtown Cincinnati featuring a live 16 piece big band, and from the Music Palace in Springdale Ohio - featuring a massive theater pipe organ! Click on the logo to the right to visit WMKV�s site! New: Jazz Legends "Bowl & Bunns" have released a new CD recorded, mixed and mastered by Sound Foundry Productions! Go to the Clients Gallery to learn more! Sound Foundry created and launched the website for Billboard Magazine's 1'st Place Jazz Song Writing Contest Winner, King "Bowl" Reeves!! And, Sound Foundry recorded, mixed and mastered the winning song! Click on the picture to the right to see the website, hear samples and learn more! CEA - The Cincinnati Entertainment Awards ceremony was held on November 19, 2006 in the Taft Theater. See photos from the event including several artists who have worked with Sound Foundry Including: "Bowl and Bunns", Jim Connerley, Katie Laur, and Steve Schmidt!! Congrats to all who participated!! Click the photo to see more. Sound Foundry provided key pictures and audio for the Tall Stacks River Boat event held every three years in Cincinnati Ohio. The 4 day event was October 2003 and 2006 and had 17 paddle wheeler boats from around the country, a music festival and much more. Over 800,000 people attended the event. Click the picture to the right to learn more!